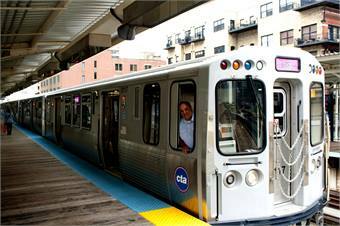 The Chicago Transit Authority’s (CTA) newest railcars now feature new LED display signs in colors corresponding to the transit system’s eight rail lines—another amenity to benefit customers. 5000-series railcars with the full-color LED signs began operating on the Pink Line last week. The signs are located on a train’s head car, as well as on the sides of each car. The full-color signs will help customers better identify trains at stations served by multiple lines. When the CTA originally contracted for the cars, color electronic displays were not readily available. When the technology became more advanced, the CTA approved two change orders to its contract with Bombardier Transportation in January and February 2012, upgrading to the full-color LED signs. The color LED signs will not cost the CTA additional money; the change orders are factored into the purchase price of $1.137 billion for the full 706 rail car order. The first 114 cars built without the color signs will be retro-fitted starting this fall. The remaining 5000-series cars already delivered will be retrofitted with the new signs. All remaining cars will be delivered with the new signs already installed. The new 5000-series cars — currently operating on the Pink and Green Lines — feature state-of-the-art technology that provides smoother acceleration and braking, creating a smoother, more comfortable ride for passengers.